Four twelve years Lynn and I have been members of the Unitarian Universalist Church of Manchester, NH. 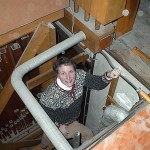 Since 2004 we’ve been the official church Sexton’s caring for the building and cleaning up after the congregation. Until the 5th of February. I’ve been taking the only action that I can afford against Paul Doolittle of Derry, NH since he stole Lynn’s 1970 Dodge Challenger. Here’s a link to another post I’ve written. Paul bills himself as “the world’s most honest man” and why not? Do you think a confidence man is going to announce his intentions to clean your pockets? No one want to come forward officially but I’ve talked with several people who’ve had a close shave from Paul Doolittle. Paul’s technique is to never got greedy. Take people for some money but not enough that his victim won’t be able to write it off under the go along to get along mentality. Then there’s the cost of legal fees and the embarrassment from admitting in public that you’ve been conned. Then there’s the crew at the Unitarian Universalist Church in Manchester, NH. After a dozen years we knew these people had their faults and hypocrisy but we forgot that we’re the wrong type of gay people to be accepted by these kinds of people. Now that was written while we were living in a tent in the woods. We did not feel safe. Even now living in our RV in now undisclosed locations we fear physical reprisal by Paul’s son Matthew or other people in Paul Doolittle’s employ. 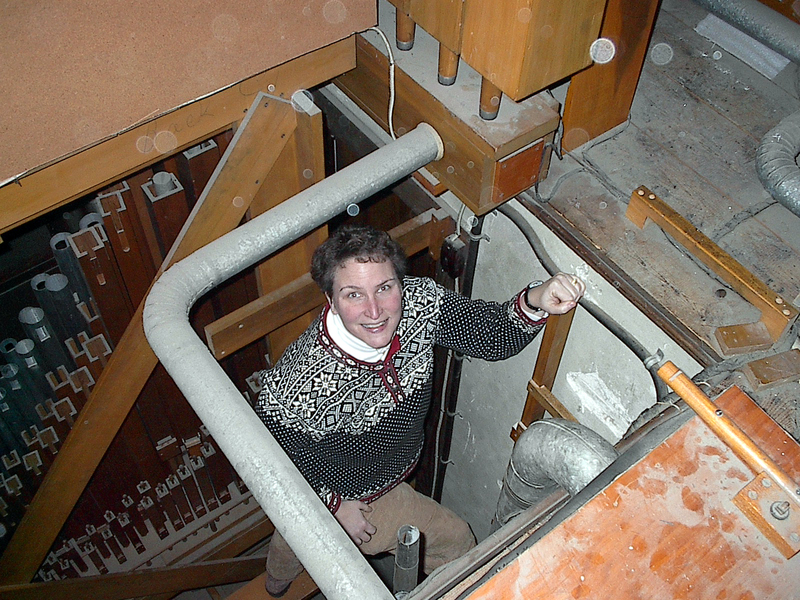 UUCM student minister Julie Lombard in the pipe chamber of the UUCM Estey pipe organ. Student Minister Julie Lombard stepped in with some productive suggestions regarding dispute resolution and we agreed to go through what could possibly be a year long process. But the only leverage we have over Paul Doolittle is our web log at http://www.arts-attic.com/blog and we refuse to take the references to Paul Doolittle and, we’re learning, the auto restorer Michael Mancini of Mike Mancini’s American Muscle Car Restorations Inc Now Mr. Mancini had a web site that was featuring Lynn’s Challenger because it is such a rare car and such a spectacular find. But the web site is down. And I have here a .pdf file from printing the Google cached page.Current Projects | Mike Mancini’s American Muscle Car Restoration, Inc.
Just in case you want to believe Paul Doolittle and the UUCM leadership when they tell you that this theft is nowhere near as big as Lynn and I are making it out to be. From where I sit, Curt Smith did a risk analysis and chose the wrong side to come down on. This entry was posted in Unitarian Universalist Manchester. Bookmark the permalink.